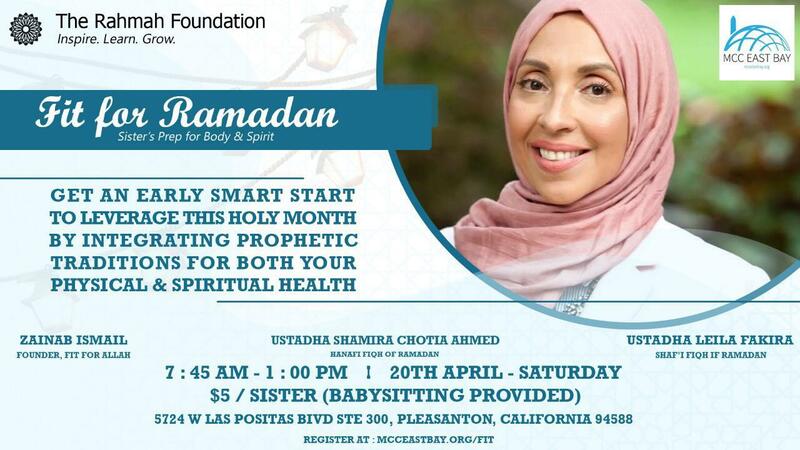 Join Sr. Zainab Ismail (Founder, Fit for Allah), Ustadha Shamira Chothia Ahmed (Hanafi Fiqh of Ramadan), and Ustadha Leila Fakira (Shaf’i Fiqh of Ramadan) to get an early smart start to leverage this upcoming holy month by integrating Prophetic traditions for both your physical and spiritual health. Sponsored by The Rahmah Foundation & MCC East Bay. MCC has a standing policy that financial need should never hold any person back from attaining spiritual or religious knowledge. Please message scholarship@mcceastbay.org for a financial waiver to attend this sister’s program. Zainab Ismail, Founder of Fit for Allah, takes on prophetic traditions regarding health, medicine, and food, and melds them with fitness practices. Zainab Ismail has over 20 years of experience as a movement therapist, nutrition coach, personal trainer, and national speaker. Her years of health and fitness experience before Islam involve working with top level athletes and celebrities. Zainab Ismail has been helping clients achieve their goals in health and fitness for over 20 years in New York City. She is a graduate Fellow of Applied Functional Science from The Gray Institute and Nutrition for life coach. Zainab has been a national facilitator for The National Academy of Sports Medicine and International Master Trainer for Free Motion Fitness. Zainab has lectured in several fitness centers here in the US as well as in Hong Kong and Malaysia. As a full-time therapist, she integrates an eclectic approach to soft-tissue therapy, movement conditioning and nutrition coaching in New York City. Zainab has presented at the national conferences ICNA and ISNA teaching exercise/nutrition for Muslim women. Zainab has also presented for various organizations, universities and institutions like the University of Toronto’s Muslim Chaplaincy, The Al-Maqasid Annual Summer Retreat, Sakina Collective’s Conscious Consumption, Safina Society’s Covert Conference, and the Mecca Center in NYC as a regular teacher. Zainab has been traveling to Chiapas, Mexico for three-years now, most recently Cuba and the Dominican Republic to work and assist the Muslim communities in these countries. Teaching essential knowledge, basic fiqh, prophetic nutrition, prophetic character, and introducing lessons from various books in Spanish. Born to immigrant parents from South Africa and raised in California’s Central Valley, Shamira Chothia Ahmed is an emerging female scholar of the traditional Islamic sciences. Having graduated as valedictorian from a large public high school, her studies led her — following a brief soul-searching stint at Georgetown University — to seek sacred knowledge from scholars on three continents — Africa, Europe, and Asia. Shamira attended Dar-ul-Uloom Mu’eenal Islam, a women’s seminary in South Africa, and Jamia Al-Imam Mohammed Zakariyya, one of Britain’s most renowned Islamic universities for women, where she completed the five-year, traditional, “Dars Nizami” curriculum. She studied the authentic ahadith collection of the Sihah Sittah and received her ijaazah (authorization) in Sahih al-Bukhari with experienced Hanafi scholars. Thereafter, Shamira was able to continue her studies in Damascus, Syria where she obtained an ijaazah in tajwid (cantillation) of the Hafs recitation from the late eminent Syrian scholar, Shaykh Abu Hassan al-Kurdi. In addition, she furthered her Arabic studies at the Abu-Noor Institute and took classes in fiqh (jurisprudence), aqidah (creed) and sirah (prophetic history) at Damascus’s Masjid Zaid. Since returning to the U.S. in 2005, Shamira has taught Hanafi fiqh for women at the Zaytuna Institute in California and other venues across North America. Privately, she has also held classes in fiqh, tajwid and Qur’anic tafsir (exegesis). In 2008, she earned a Master’s Degree in Demographics and Social Analysis from the University of California at Irvine, focusing on the identity formation of the Muslim-American population. Shamira is also one of the co-founders of the Rahmah Foundation, an empowering American-based women-to-women organization dedicated to providing qualified scholars to spread fardh al ‘ayn knowledge. Her latest endeavors include her popular “Blessed Birthings” seminar on natural childbirth in Islam, and “Nursing Your Baby Naturally”, a course based on her qualification as a certified lactation educator/counselor. Currently, Shamira is specializing in the detailed rulings of menstruation, lochia, and abnormal discharge under the direction of Mufti Abdur Rahman Ibn Yusuf Mangera. Shamira is both a wife and mother, and she enjoys giving interactive and uplifting talks to sisters across the U.S.
Ustadha Leila Fakira Ustadha Leila Fakira has a passion for Islamic knowledge and has taken several courses with various Islamic organizations within the Bay Area with several teachers local and online. She has a verbal ijaz to teach Qu’ran and Shafii fiqh and has taught women and children privately since 2006. Leila spent several years homeschooling her own children and teaching other kids within the community. Also she is currently leading our Women’s Seerah Book club here at MCC. Along with her Islamic studies, Leila holds a Bachelor’s of Science degree in Accounting and worked several years in the workforce before deciding to dedicate herself to her family and her Islamic studies. Leila lives in Dublin with her husband and two children.